Despite the high concentration of Oscar winners (Charlize Theron, who also co-produced) and Emmy nominees (Christina Hendricks) on the poster, Dark Places is the definition of a B-movie. (It would definitely play at the bottom half of a double feature with the last Gillian Flynn movie adaptation, Gone Girl.) French screenwriter-director Gilles Paquet-Brenner is capable, keeping the whodunit plot relatively easy to follow across shifting time periods and perspectives. But aside from the A-list cast, there isn’t much to differentiate Dark Places from an especially grim TV movie. The twists here aren’t quite as outrageous as in Gone Girl, but the subject matter is as relentlessly morbid and outlandishly lurid. Maybe even more so: Exploitable elements include serial-killer culture, ’80s satanic panic, and perhaps most disturbingly, the now-discredited phenomenon of Satanic ritual abuse. The moral universe of Flynn’s work is akin to that of the most nihilistic noir, where everyone is, at minimum, a liar, with escalating degrees of evil spiraling outward from there. A character isn’t just homeless, he lives in a shanty town in a literal toxic waste dump. People don’t just lie to get their way, they kill. Things can always get darker in a Gillian Flynn adaptation. Theron stars as Libby Day, a thirtysomething woman whose entire life has revolved around being the only survivor of the Kansas Prairie Massacre that killed her mother and sisters when she was 8. The royalties from her tell-all about to run out, Libby accepts an offer from eccentric laundromat owner Lyle Wirth (Nicholas Hoult) to speak at a meeting of “Kill Club,” a “secret society” of amateur detectives that has been investigating her family’s case. Libby initially balks when she’s told that the club thinks her brother Ben (Corey Stoll), who was convicted of the murders basically for being a teenage metalhead, is innocent. But driven by curiosity (and a generous subsidy from Lyle), Libby begins to revisit the events leading up to her family’s murder. Twists, turns, and shocking acts of violence ensue. It’s all rather slick, and fun to watch in a twisted sort of way. But it’s that same slickness that fails to lift Dark Places above potboiler status. Certain scenes hint at larger social themes. A flashback where Libby’s mother (Christina Hendricks) is confronted by neighbors hurling pedophilia accusations evokes The Crucible. Lyle and Libby attend a party where people dress up like John Wayne Gacy and the Black Dahlia. Ben’s plight is shades of Paradise Lost: The Child Murders At Robin Hood Hills. But ultimately, the movie doesn’t have anything to say about these things beyond the titillation factor. Like an old-fashioned detective magazine, Dark Places lays down depraved plot points one after another, continually trying to outdo itself. This approach doesn’t leave much room for nuance. Themes are explicitly hammered home in dialogue, and little about the character’s motivations hold up to thoughtful scrutiny on the car ride home. (Casting Theron, Hendricks, and Stoll as blood relatives is also a bit of a head-scratcher.) But if you go in expecting a pulpy thriller—an R-rated Lifetime movie, if you will—Dark Places is an enjoyable, if morbid, guilty pleasure. Just forget about the whole Oscars thing. 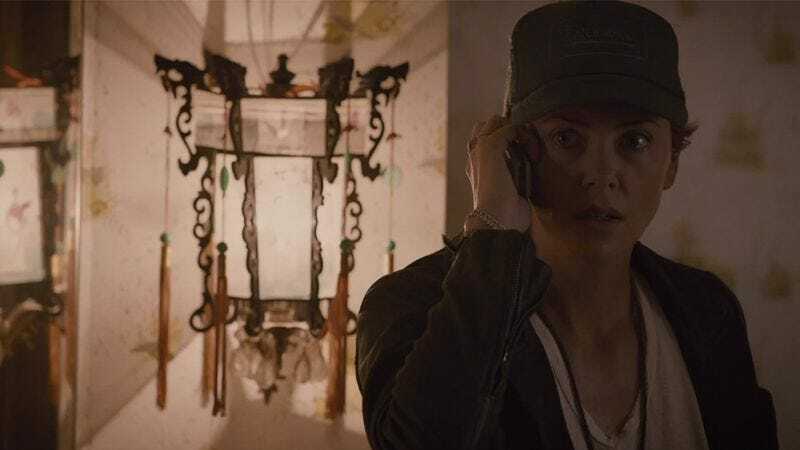 For thoughts on, and a place to discuss, the plot details not talked about in this review, visit Dark Places’ spoiler space.